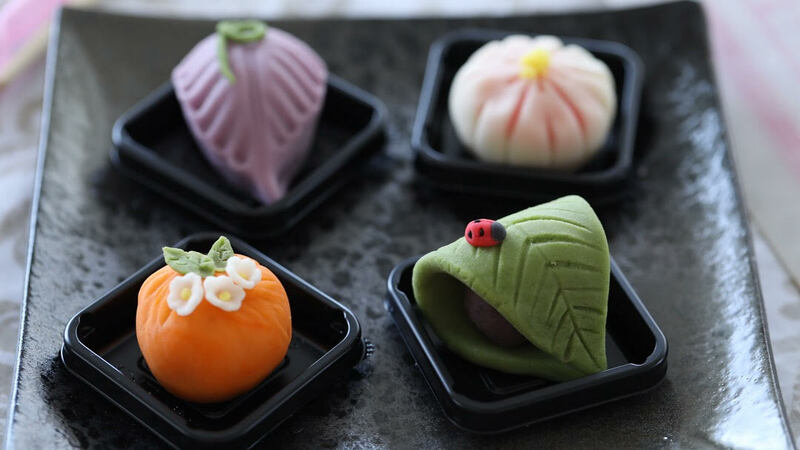 This one day course is for anyone who wants to experience the art of wagashi-making, Class will begin with making the nerikiri dough made from sweet white bean paste, sugar and mochi powder, then proceed to coloring and shaping the dough. The course will finish with tasting your creations with a bowl of matcha green tea. You can also take the wagashi home in a box. For those who want to learn about mochi (rice cakes) please join the Mochi Course which will teach some popular mochi dishes. Class is suitable for beginners, children, and adults of all ages. Please see the class calendar for the next wagashi class schedule, or please request a date (for booking of 2 or more). Wagashi Course - Japanese traditional sweets. Served with Matcha Green Tea. Fee: please contact me for a quotation with party location, age and number of participants. Q: Who can join the class? Is there a beginner course? ​A : The One day Course is suitable for participants 5 years and older. The class can be customized according to your level by choosing a simpler motifs to do. Q: What motifs will we be making? Q: What is the wagashi made of? Q : How do I book a class? ​A: Please see this page on how to book a class.